Written on December 31, 2007 by Kevin. One of Rylan's Christmas gifts this year was a full soccer set that included a goal, a ball and a few cones. We didn't have the best luck at his soccer practices as far as participation and we blame this on him being both shy and us not getting him more practice before. Now that we have our own goal everything is going to change. I took him out to play soccer yesterday and it took a bit for Rylan to warm up to it all. We were playing in a new grassy area so Rylan was a bit distracted with all of the new places to run. After a while though, he really got into it and was doing his best to kick it as far as he could. The excited look on his face when he kicked it was amazing. After a bit, Kaitlyn and mom walked out to see what was going on. It didn't take long before Kaitlyn was kicking the ball too. Of course this was with the help of her father. Rylan got a laugh out of it though. I think Rylan will enjoy going outside to play more soccer and it will hopefully keep him from wanting to play it inside. In the past we have seen a few other kids about Rylan's age at the grassy area so maybe someday he can meet up with them. For now, I'll be the goalie and he can be the kicker. Written on December 28, 2007 by Kevin. Written on December 27, 2007 by Kevin. Oh what would the Christmas season be without a trip to the emergency room? My wife has been exclusively breastfeeding Kaitlyn for nearly 6 months now. We have started feeding her the occasional bowl of rice cereal however that is always a slow process to get them adjusted to it. In the meanwhile, my wife decided to give her the first bottle that she has ever had. A bottle filled with formula. We let Kaitlyn try to work with the bottle herself but she was just too fussy and after a bit I had taken her out of her chair. It was mere minutes later that I noticed her face was all red. Further examining it, she had red bumps all over her face. She was having an allergic reaction to the formula. Now in semi-panic mode, we made the quick decision that we needed to go to the emergency room because she was already sounding different like her throat was tightening up. We replaced her clothing and discovered that any place that the formula had touched including her hands and chest were also having the reaction. We headed out quickly. My wife sat in the back of the car with the kids as I quickly rushed to the ER as she was saying that Kaitlyn didn't look well. Crying in a different way than normal is always something to notice. When we got to the ER, we were lucky to get taken in pretty quickly. After a quick examination, they gave her some Benadryl medicine which quickly took care of the redness and bumps. They monitored her for a bit and released us. So we are at a bit of a loss here in regards to what exactly caused the allergic reaction. The formula was milk based which of course could mean she is allergic to milk. Then again, she is breastfed which is milk also. Is her eczema caused by the breastfeeding but in a milder manner? The doctors won't give her an allergy test because she is too young they say but it sure would be nice to know exactly what she could have troubles with. In the meanwhile, back to breastfeeding she goes as we transition her into cereals skipping the formula part. It was certainly an interesting way to start the Christmas weekend. A large leap was made this weekend however with her as she now is able to keep herself entertained with some of the new Christmas gifts that she was given. We couldn't be happier. The many days of Christmas.. Written on December 26, 2007 by Kevin. Rylan and Kaitlyn had quite an eventful weekend. We started the celebrations off on Saturday by heading over to their Aunt's house. Grandma Debra and Grandpa Paul where there as well. After eating a tasty Mexican dinner, the kids opened their gifts. Kaitlyn and Rylan scored a couple great toys. Rylan was the official gift passer outer and he did a very entertaining job at it. Christmas Eve was celebrated at their grandparents Tina and Fredrick's house. We had a huge turkey and ham dinner with all of the fixings. Rylan was too hyped up though and didn't even touch his food. After his Great Aunt Carmen came over, Rylan had a ball opening gifts for everyone. Rylan had fun trying to build a gingerbread house before it ended up collapsing. Decorating the gingerbread men were much easier and from what we could tell, they were quite tasty as well. Christmas morning was celebrated at our house. We woke the kids up and took them downstairs to wait patiently for Grandma Michelle to arrive. Rylan was thrilled to see gobs of presents heading into the house. He couldn't stop saying "Christmas!". Last night, we headed over to Grandma's house for Christmas dinner. The kids had so much fun yesterday that they both fell asleep in the car and barely woke up when we got home. There was one gift that really stood out this year for Rylan and it happened to be a toy BBQ grill set. He can't get enough of it and must have made 50 burgers for us when the day was through. Kaitlyn is quickly learning the benefits of toys and she too seems to have a few new favorites including the her LeapFrog brightlings toys. We had a great holiday and the kids definitely seemed excited as well. Written on December 21, 2007 by Rylan & Kaitlyn. Written on December 21, 2007 by Kevin. The Week in Review today will be postponed until tomorrow. 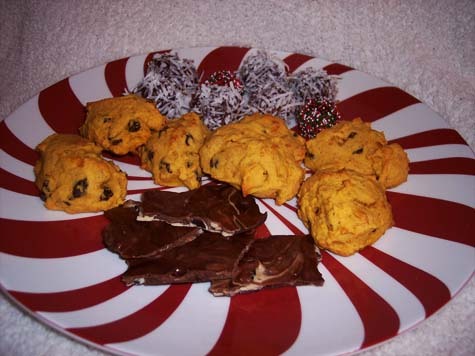 In the meanwhile, stare at these fine cookies and candies that my wife and I stayed up for hours making last night. Written on December 20, 2007 by Kevin. We have been anticipating and dreading the idea of seeing Santa lately. We had seen him at the breakfast a few weekends ago but Rylan definitely knew that it was not the real Santa and he was not in the mood to play games. He refused to sit on his lap and the picture had to be taken with me with him. We headed over to see Santa last night. Common sense would tell you that going at 5:00pm was a bad idea but we pressed onwards. As we pulled into a parking spot it dawned on me. We didn't have a stroller in the car. This was not the way to start the night off. As we approached Santa I got a peak and what did I see.. 8 zigzagging lines of restless kids and tired adults. As we progressed towards Santa at a snail pace, we realized that Santa had gone to take care of the reindeer. 30 minutes of waiting later, he was back. Rylan was excited to see Santa this time around. He was waving and yelling out "Santa". He even got a wave back. I talked him through seeing Santa as we got closer and you could tell he was getting a bit nervous. We plopped Kaitlyn down on his lap first to show Rylan what was going on. He wasn't thrilled about sitting on Santa's lap but he stuck it through and didn't scream or try and run off. The first 10seconds though he had the grumpiest face ever and refused to look at the camera. A shout of "Peter Pan" woke him up and he began giving us some smiles toward the camera. It was difficult to get a good photo with 2 kids doing their own things but we were happy with it none the less. Kaitlyn did well as expected and barely moved. So after all was said and done, we waited over 2 hours to see Santa. We paid $25.00 to see Santa for 20 seconds and all we have to show for it was a few pictures and some memories. Was it worth it? Minus the feeling that we were robbed, it was definitely worth it and I'll confirm this in 50 years when I can't remember anything and I can look back at the photos and smile. Written on December 18, 2007 by Kevin. Rylan has a thing about being dirty. When he is eating and his hands get messy, he quickly says "hands dirty" which of course means he would like for us to wipe down his hands. 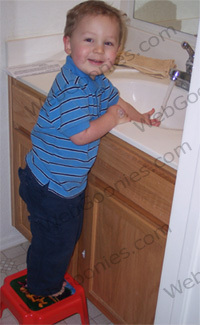 Not wanting to do this forever, we started asking him to wipe his own hands and face. He does it without fuss most of the time. The funny part is that if his hands are just covered with food and you barely touch the napkin to his hand, he will be satisfied and go back to eating. Written on December 17, 2007 by Kevin. Written on December 14, 2007 by Kevin. Written on December 12, 2007 by Kevin. 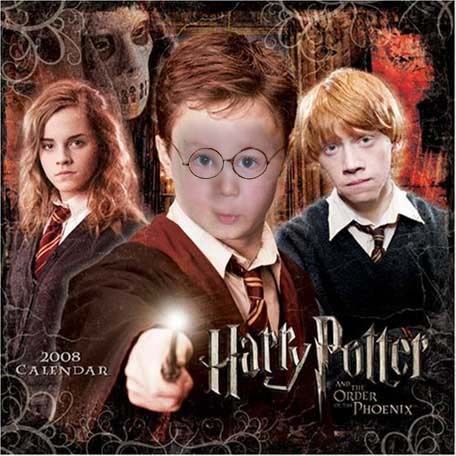 In the ever changing world of Rylan's favorite movies, Harry Potter seems to be near the top of the list lately. While we have rarely played these movies for him, something about the commercials lately sure has made him interested. He even points out the Harry Potter DVDs from our entertainment center just by looking at the sides of them. A quick burst of "Harry Potter!" tells us that we have found it. Written on December 10, 2007 by Kevin. The grandparents this year invited the kids to have breakfast with Santa at the local Kiwanis Club. We headed over there early in the morning and to Rylan's surprise they had model trains setup. He loved watching these trains go by and was always thrilled when he saw a Donald Duck and Pluto train go by. Shortly following was a Mickey and Minnie one which got him pointing and yelling even more. We could have sat there all day and Rylan would have loved every moment of it. We headed in for breakfast and while Kaitlyn was sleeping, Rylan had a chance to do a bit of coloring. He did really well drinking his orange juice from a regular cup and then shortly afterwards, he knocked it out all over the table. After a bit of cleanup, we received our meal. A small breakfast perfect for the little kids included a few pancakes and a piece of sausage. Rylan loved dipping his pancakes into the syrup and of course getting it all over his shirt. It was time to see Santa. Kaitlyn sat down first and she did great. She had no problems sitting on Santa's lap and only gave a bit of a cautious look more than anything. Rylan on the other hand flipped out and refused to sit on Santa's lap. 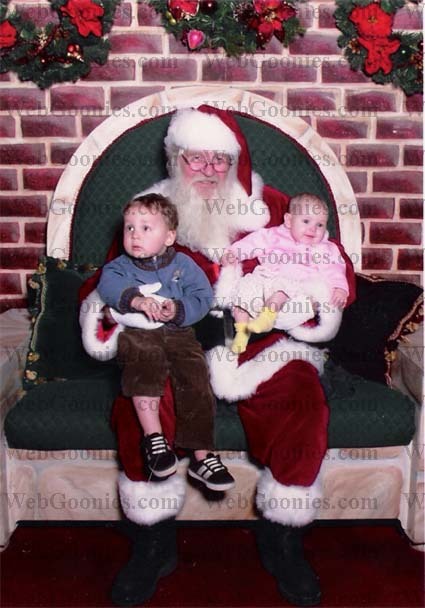 Instead, we had to get a picture of him on my lap kneeling next to Santa. He was super interested in Santa but just not in sitting on his lap. The kids were each given a goodie bag which included a hand puppet and a blowup snowman ball. Rylan has been enjoying his ball ever since. We will be having another meeting with Santa soon and hopefully Rylan will not be as freaked out. Though if he is, it's just another funny picture to show his wife someday. Written on December 7, 2007 by Rylan & Kaitlyn. Written on December 6, 2007 by Kevin. The Consumer Action Guide to Toxic Chemicals in Toys. This is a must have bookmark for all parents and grandparents. Find out how many chemicals are in your toys and toys you may be purchasing for Christmas. It is critical. The world is crashing down.. It is a sad day for me. Sad indeed. I was checking out babble.com, which is a parenting website that I was unfamiliar with. I was browsing all of their sections and I came across an article about the Johnny and the Sprites show. This is one of the shows that Rylan enjoys to watch and it's not too terrible that sometimes I can even enjoy it. What I found when I went to that article shattered the world around me. The article was in fact a field trip into the production of the show and I am saddened to tell everyone that the sprites are not real. They are only puppets! Take a moment to process what I just said. Now breathe. Yes, I said the sprites are not real. Please do not let your children know as they may not want to get out of bed in the mornings any longer. Pulling myself together, let me finish. Babble has a great field trip article about the production of the Johnny and the Sprites show. It's a great look at behind the scenes of the show and if you care to show it to your kids, it would be a great learning lesson. They also have a field trip to production of the Little Einsteins show which is equally as good. Check them out. Written on December 5, 2007 by Kevin. From nearly day one, we have been battling with Kaitlyn's cradle cap and eczema. We had tried the recommended baby oil which did nothing but irritate her. After months of telling the doctors we finally were given a few samples of an oil steroid. This worked great actually but reading the warning on it which tells you not to use it more than 4 weeks certainly put up a red flag. We mainly focused on her head which was badly covered and when that seemed to clear up, we stopped the steroids as to not over do it. It quickly came back for Thanksgiving just as strong as before. Yesterday we had an appointment with one of the nation's leading child dermatologist. After his review of the situation he basically told us that she is entirely covered in eczema minus a few healthy spots. While the most noticeable issues are on top of her head, she also has blotches of rough skin randomly over her body. He gave us a prescription for a bit stronger of a steroid than before and told us that it is perfectly healthy to use them as long as we need too which was a bit surprising to us. 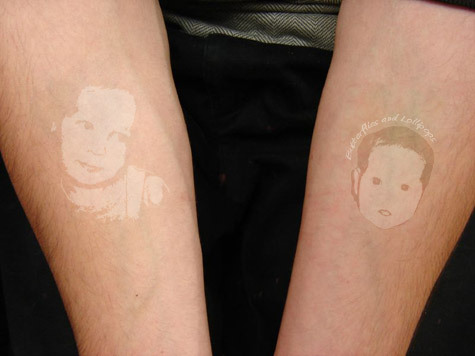 I believe the idea is that the skin is treated fast enough before any damage could really occur. It is a hard one to swallow nevertheless. We started the new treatment last night and in just a few days we should see a big improvement. We really want to get this under control as you can tell it is driving Kaitlyn nuts. She continues to rub and scratch her head in hopes of helping the itching. It's hard watching her struggle. Written on December 3, 2007 by Kevin. My wife began telling me about her interest in the Nintendo Wii a few months ago. While a Wii shortage was in full effect, we decided to look anyways. No luck. I had taken the day off after Thanksgiving with the plan that I would be one of those people standing outside of Target waiting for the doors to open so I could rush to get my Wii. It never was necessary though. We headed up to Flagstaff, AZ the day before Thanksgiving to celebrate with family. As I walked into my Uncle's home, my eyes were immediately fixed on the Wii that they had. Turns out, it was my fathers. He had mentioned it in the past but I didn't realize he would actually buy one for himself. So how did he get it I asked. To my surprise, he had gotten it just that day from the local GameStop. We quickly went back so I could get one myself. Amazing, they still had some. There was now no need to stand in the long lines in the freezing winter weather. The first thing after getting back home was of course setting up the Wii. Everything went smoothly and off we were going. My wife and I can play this for hours without even noticing. Rylan loves to play with us as well but he has his own controller. He gets to swing around the DVD remote instead of the expensive Wiimote. He couldn't be happier. It will be fun to transition Rylan into playing the games with us and watch him learn how to hit the golf ball or bowl a strike. The Wii is 100% a family gaming system. It definitely requires you to get up off of the couch and get active. Playing with a bunch of people just makes it that much more fun. I would have certainly waited in line early in the morning for this and found that it was worth it. Luckily though, I didn't need to and I got to spend the morning with the family.